The McDonald's factory in the UK produces three million burgers a day! Along with all the other ingredients, it takes a lot of time, money and effort to construct a Big Mac. 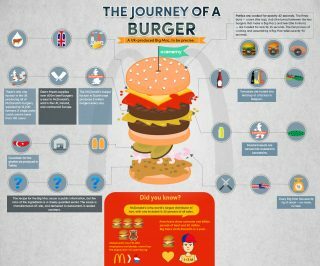 This infographic looks at how it all comes together. The ingredients in a McDonald’s burger bun are (source: Food Matters): Enriched Flour (Bleached Wheat Flour, Malted Barley Flour, Niacin, Reduced Iron, Thiamin Mononitrate, Riboflavin, Folic Acid), Water, High Fructose Corn Syrup and/or Sugar, Yeast, Soybean Oil and/or Canola Oil, Contains 2% or Less: Salt, Wheat Gluten, Calcium Sulfate, Calcium Carbonate, Ammonium Sulfate, Ammonium Chloride, Dough Conditioners (May Contain One or More of: Sodium Stearoyl Lactylate, DATEM, Ascorbic Acid, Azodicarbonamide, Mono and Diglycerides, Ethoxylated Monoglycerides, Monocalcium Phosphate, Enzymes, Guar Gum, Calcium Peroxide), Sorbic Acid, Calcium Propionate and/or Sodium Propionate (Preservatives), Soy Lecithin, Sesame Seed.